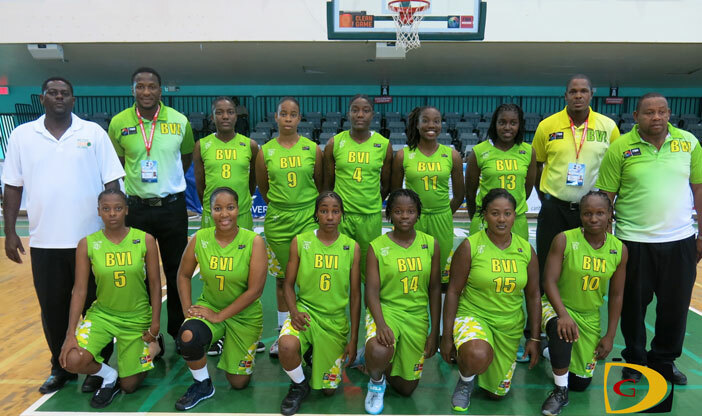 The first Women’s team ever assembled to represent the territory in the 41-year history of the BVI Basketball Federation, ended its Caribbean Basketball Confederation Championships debut the same way their started it—with a victory over Guyana. The BVI secured a 64-61 triumph over Guyana when the second CBC Women’s tournament to be hosted here, began on June 8. They fell to Barbados, 79-49, before losing to defending champs Jamaica, 61-28. They lost the game that would have put them to play for fifth and sixth place to St. Vincent and the Grenadines, 71-67. In the finale, they overpowered winless Guyana, 72-62, with hot shooting in the second half, after leading 30-28 at the break. The BVI finished seventh with a 2-3 mark, while Guyana was 0-5. McKenzie who had eight of her 22 points and seven of her 16 rebounds at the half, helped Guyana tie the game at 30-30, with 8:30 left in the third period, then missed two free throws after a Tiffany Jennings’ personal foul. From then, the BVI took control of the game with a 13-0 run to lead 43-30. Sisters Tyalia Nibbs-Henley and Tamara Phillip hit back to back treys during the run and another later on from Daeria Malone—whose trey sent the BVI into the half with a 30-28 lead—hit her fourth of six on the afternoon—and the BVI padded its lead to 18 points, 54-36 with 1:46 left. Trailing 70-59 with just under a minute to go, McKenzie’s 3-point attempt was swatted into the crowd by Tamara, to preserve the BVI cushion. Tamara narrowly missed a triple double with 21 points, 13 boards and nine assists to go with five blocks and four steals. Malone came off the bench to drop in 16 points.